Remember how in school, we used to give out Valentine's Day cards and candy to everybody in class? Now that we're grown up, nobody spreads the love anymore, sadly. KFC is giving us a chance to relive our childhood, though, with some hilariously nostalgic scratch n sniff Valentines that yes, smell like chicken. Four different types of Valentines were made, each of which contain a cringe-worthy KFC pun. The back of each card is supposed to be scented like KFC's fried chicken, with a simple scratch activating the aroma. Foodbeast got a few in the office, and they smell more like chicken-flavored Top Ramen than fried chicken. Still, you'll get people leaning with laughter at the KFC dad jokes and the poultry-scented Valentines. 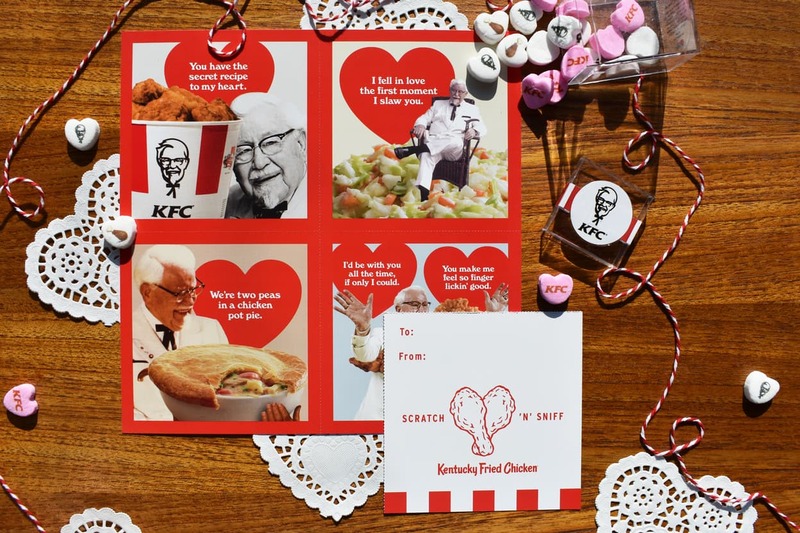 If your Valentine is super into KFC, then these scratch n sniff Valentines would probably be a fun way to work their love of fried chicken into your elaborate V-Day gift. Otherwise, it's probably best to hand these out to your squad as a hilarious reminder of their childhood. KFC will have them available starting next Monday, February 12th, where they'll come for free with the purchase of a $10 Chicken Share while supplies last.